Julian Assange has been suggesting that Wikileaks would soon drop a bombshell of files related to Hillary Clinton. Many have been awaiting the highly-anticipated announcement from Assange, who delayed the release of those files. Now, another infamous hacker, who goes by the pseudonym Guccifer 2.0, has released files pertinent to the Clinton Foundation, ahead of Assange. Guccifer 2.0 was able to penetrate the Clinton Foundation databases, where the hacker uncovered some of the most severe evidence to date regarding the foundation’s corruption. Guccifer 2.0 suggested that many people were growing impatient awaiting the Wikileaks announcement, so the hacker took the matter into his own hands to exploit the data. 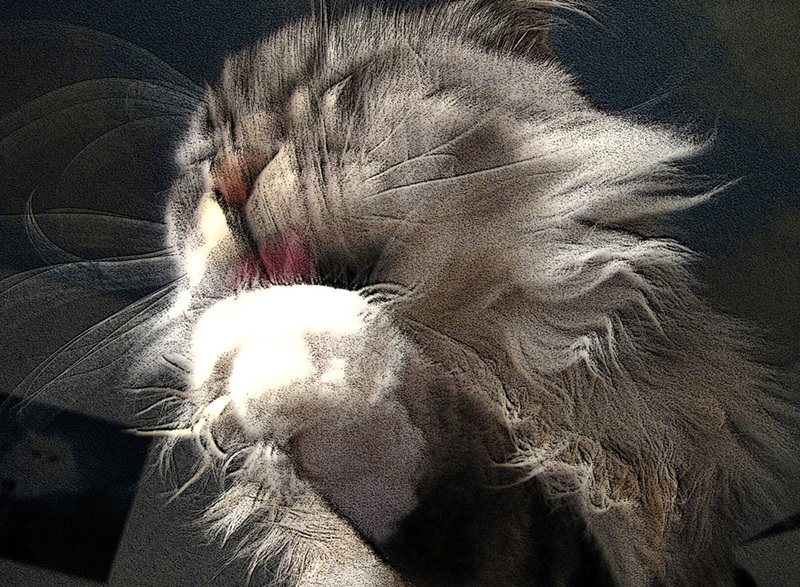 “Many of you have been waiting for this, some even asked me to do it. So, this is the moment. I hacked the Clinton Foundation server and downloaded hundreds of thousands of docs and donors’ databases,” said Guccifer 2.0. The latest revelations show the Clinton Foundation was committing fraudulent activity, which netted them millions of dollars. When Obama demanded that congress approve more bailouts between 2009 and 2011, it seemed as if kickbacks were offered to Democratic politicians from the big banks, but through the Clinton Foundation. This included Hillary, who was to ensure that the bailout got approved. Clinton aided the big banks in bribing the Democrat politicians. “Democrats funneled tarp funds back to their PACs! That’s taxpayer bailout money that went right to the pockets of Democrat PACs,” wrote Guccifer 2.0. Essentially, through a slew of shady deals with the big banks, taxpayer money went straight into the pockets of crooked Democrats. For criminals, Hillary Clinton and her staff don’t try very hard to protect their damning data. It was only a matter of time until hackers would force their way into the Clinton Foundation’s servers. Will the big banks and corporations be penalized for agreeing to donate a percentage of their allocated TARP funds to the Democrats? This is the exact type of corruption and fraud that Donald Trump expressed concerns over, needing urgent corrections in Washington. 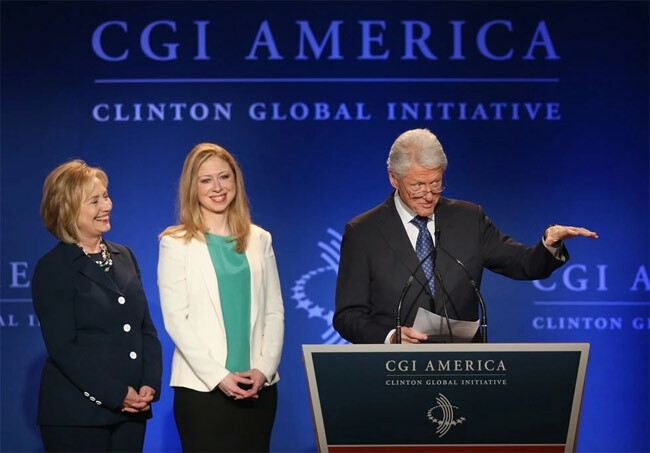 The Clinton Foundation had previously announced that it would be laying off 22 of its staffers on the Clinton Global Initiative, as a way of dealing with the fallout proceeding Clinton’s presidential campaign. 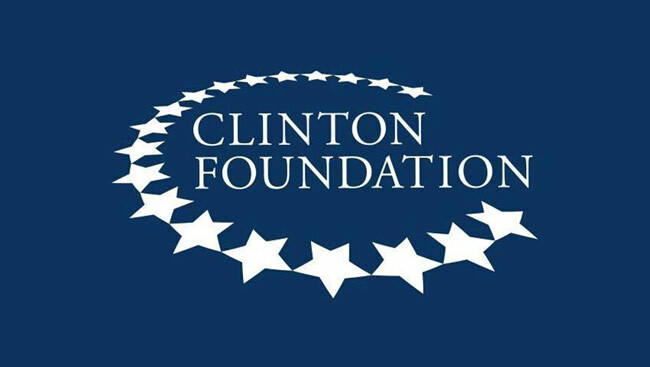 The ultimate discontinuation of the Clinton Global Initiative resulted from strong pay-to-play allegations which occurred while Clinton was secretary of state. It’s unclear how many of the 200 Clinton Global Initiative staffers are still involved with the Clinton Foundation. 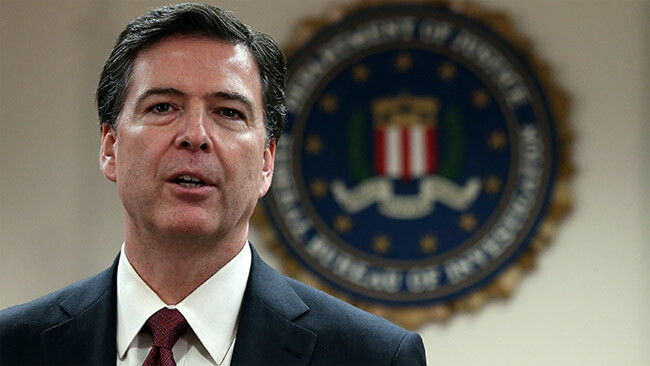 The FBI still has an ongoing investigation into the Clinton Foundation concerning allegations of corruption during Hillary’s tenure as secretary of state. 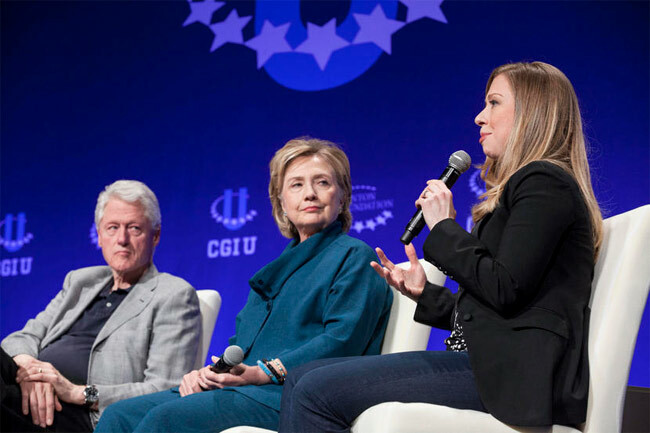 The decision to discontinue to Clinton Global Initiative reportedly caused a ruckus within its inner circle, regarding the best way to deal with the fallout stemming from the allegations. Some staffers admitted that the layoff process was handed “insensitively,” while other staffers were heated with optics that considered allowing some Clinton Global Initiative staffers to stay on board. FBI Director James Comey has also been probing The Clinton Foundation for some time. Comey showed strong interest in some of Bill Clinton’s last-minute presidential pardons, and was excited to pursue a criminal investigation. Bill Clinton pardoned fugitive financiers Marc Rich and Pincus Green, setting off a red flag for Comey. The FBI’s probe into the pardons focused on contributions to the Clinton Foundation. Marc Rich’s ex wife, Denise Rich, donated $450 thousand to the Clinton Foundation. Was this an exchange for the pardons? 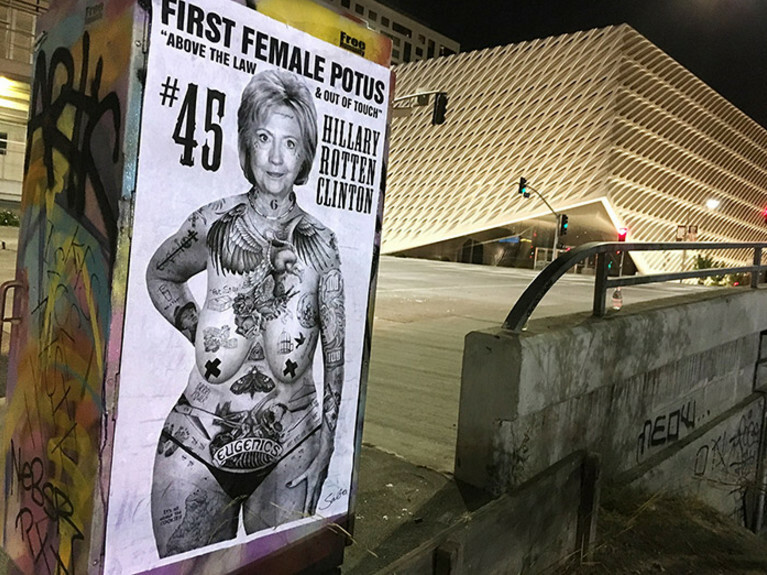 Bill Clinton denied any links between the donations and the pardons, and did not face any charges. Records released this week hint at more probes involving the Clinton Foundation, A recently disclosed file shows a 2009 federal grand jury subpoena from New Orleans, which seeks records opposed to testimony. It’s currently unclear weather the subpoena was issued to the foundation, or just relates to it, but the subpoena appears to relate to a probe into fraud against the government. 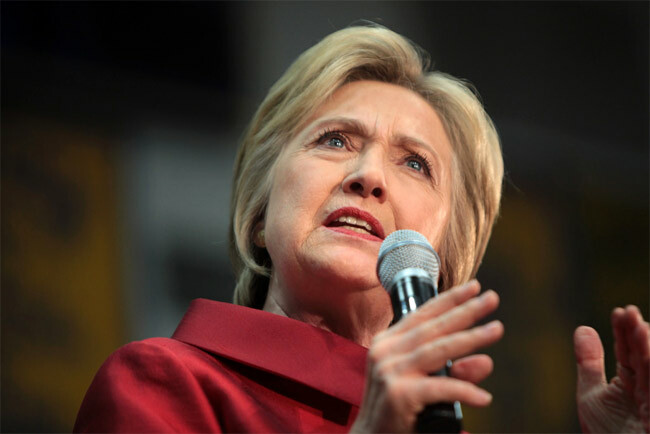 Datto, Inc. informed Congress in October 2015 it provided the FBI with the storage node of containing emails from Hillary Clinton’s private server. 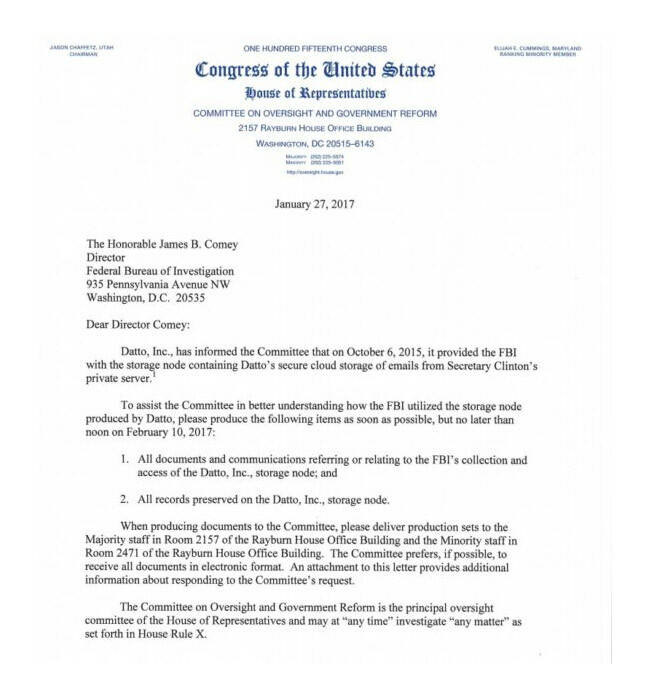 Today the House Oversight Committee demanded that FBI hand over the emails they have been holding for over a year now. “A Daily Mail Online investigation has found that a second firm – hired to store a back-up of Clinton’s secret server – was so lax in its security employees failed to change passwords frequently and left computers logged in, unattended for extended periods and its own clients stumbled upon other clients data.